The Tiger rugby team looks to build off of last year’s success. The team finished 3-4 overall, with all three of the team’s wins coming in conference play last season. The team advanced to State, where they were knocked out in the semifinal round by Southeast Polk. Southeast Polk would go on to become state champions. Senior Brendan Alexander works to bring down a ball carrier in a game last season. “The loss to [Southeast] Polk was tough, but at the same time we had a lot of success in only our first year as a program. 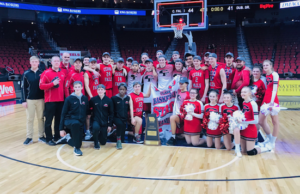 I don’t think anybody thought we would get as far as we did,” senior captain Austin Mennen said. Starting a rugby team was the idea of Mennen who put together a team in a few months last spring. Mennen had trouble finding a coach at first. He knew some people who had a background in rugby, but they either didn’t have the time to coach or they didn’t have a coaching license. Finally, Mennen contacted Michael Klostermann, a UNI student who was more than willing to coach the team. Although rugby still isn’t a school-sanctioned sport, Mennen said he hopes that eventually it will be. “I don’t see rugby becoming school-sanctioned anytime in the near future, but it would have to be by 2015, or else Cedar Falls won’t be able to compete at State,” Mennen said. Last season the team shot themselves in the foot a couple times due to their lack of knowledge about the rulebook, and team members said they won’t have any problems similar to that this season now that they have more experience under their belts. “The older guys will be able to help the younger guys. Knowledge of rugby rules will be a focus in our early practices,” Mennen said. 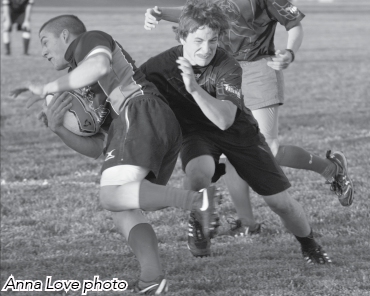 Mennen has big plans for the rugby team this season and in the upcoming years. He said he hopes to continue expanding rugby in the Cedar Valley and making it more common in area high schools. This season Waterloo West, Waterloo East, Waverly Shell-Rock, Columbus and Aplington-Parkersburg all have proposed rugby teams to their schools. “The success that we had last season is definitely what has influenced some area high schools to try and get teams, and with rugby being an Olympic sport in 2016, there’s a bigger push than ever before for high school rugby,” Mennen said. The team is still looking for a few more players for this more season. Anybody interested should contact Mennen.